Houzz completes your personal abode. Houzz is the popular name among marketplaces that show you "the new way to design your home." It is the well-known marketplace offering multifarious products cataloged under kitchen, bath, bedroom, living room, outdoor, lighting and more. From finding home professionals, innovative and creative design ideas to shopping varied home-decking up products, Houzz lives by its promise of letting you ' create the home you've always wanted." Do you harbor the desire of being a Houzz seller and want to put the reins of managing your Houzz store on trusted marketing pros? We, ChannelSale are here, by your side to offer you software solutions and with our exhaustive managed tools, integrating with Houzz.com, the well-known marketplace, becomes easy. If you are a retailer or a business owner and want to integrate with Houzz.com, then make the best of our software solutions. We let you to invest your time and grey matter so that via strategic thinking you can lay stress on the other aspects of improving your business while we take care of Houzz.com inventory management and automated product listings with our software. We ensure that we offer you the best services with our high-end software solutions. No matter how multi-faceted your products might be, Houzz.com product listing will be an easy process for us with our high-end product listing tools. We offer you impeccable product catalog management services in various shopping sites. The data transfer process that we engage in is free of errors and you do not need to worry at all when we act as your store manager. The process of Houzz.com product data feed management and optimization gets simpler, easier and smart with our marketing pros and high-end software easing out everything. Are you worried about your various business functions like order tracking and shipping aspects, we take care of all with full acuity and in a professional way with our well-planned Houz.com order and shipping tracking management services. If you are thinking how we go about the product listing process on Houzz.com, then this is the answer for you. We create the listing on Houzz.com via your product feed file in formats like CSV, TXT, XLS or API-XML. Then we synchronize it with Houzz.com along-with the big names among the online marketplaces, comparison shopping engines and affiliate networks. 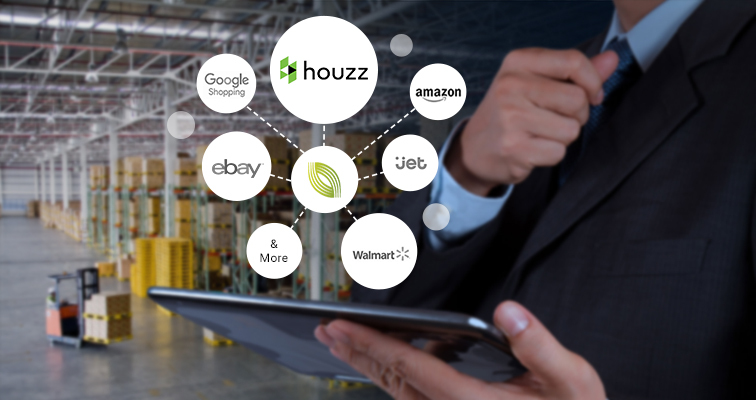 ChannelSale can integrate your product data feed to automatically flow in to Houzz.com marketplace directly from your webstores such as Magento, BigCommerce, Volusion, Shopify, Yahoo store, AmeriCommerce, NetSuite, 3D Cart, Pinnacle cart amongst others. The Jet.com orders and shipping tracking updates can be synchronized with platforms such as Fulfilled by Amazon, SKU Vault, ShipWorks, ShipStation, StoneEdge, OrderMotion, OrderLogix, SOS Inventory and others. Granular level product category mappings pave the way for apt listing in sync with Houzz.com product category. Have variable pricing for Houzz.com and other marketplaces / shopping engines, or retrieve your Houzz.com pricing to be sent to other shopping engines or markup pricing over cost price. ChannelSale offers real time inventory services, for you to track product performance. For example - If a product sells on Amazon, eBay, Sears, Rakuten, Wish etc., the updated stock in hand would reflect in your ChannelSale account and further on Houzz.com. Centrally manage all Houzz.com orders and shipping tracking updates. Automate exporting Houzz.com orders to third party order fulfilment platforms / dropshipper’s, Fulfilled by Amazon, or to suppliers on an hourly basis. Setup to automatically retrieve order shipping tracking number on Houzz.com. Ensure that your business is in safe hands with us. Let us give vent to your multi-channel marketing plan and help you taste success with your business getting stronger and stronger! Call now for Houzz.com integration and automated product listing services.